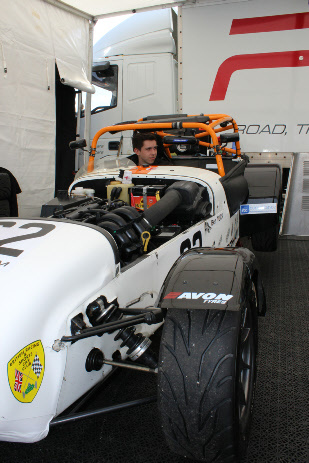 During an incredibly tough second race weekend in the Caterham Supersport Championship, Ben Tuck battled mechanical issues, penalties and crashes to make a stunning Race 1 recovery drive from 37th to 11th at the Anglesey Circuit in Wales. In Race 2 Ben suffered engine problems before a heavy rear quarter impact caused suspension and exhaust damage to his ailing car, after which Ben had to nurse his car to the finish in 20th. Satisfied that he had extracted the maximum possible result under the circumstances from Race 1, Ben set his sights on moving forward to battle with the leaders in Race 2, starting in 11th place. He managed to climb to 9th place before power problems hampered further progress and before long he had to defend from the chasing pack each lap. With two laps to go Ben unfortunately suffered a rear quarter impact which damaged the car and sent him spinning off the track. With badly damaged rear suspension, Ben carefully guided the car to the flag, coming through in 20th place. 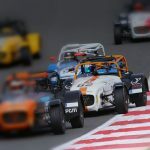 In his second Caterham race weekend Ben again displayed that despite a myriad of problems he could remain focused and deliver a hugely impressive performance under the most difficult of circumstances. 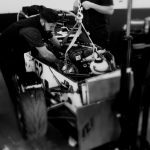 The car will now return to PT’s workshops for investigation and repair before the next round at Zolder in Belgium on 4th and 5th June.